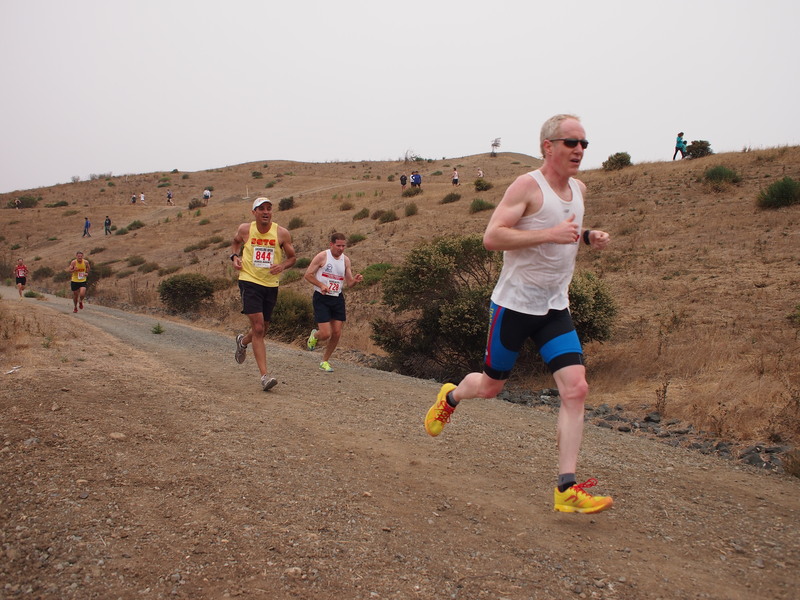 I wasn’t planning to race today, but I got pressed into service yesterday afternoon by my San Francisco-based running team, who needed another runner in order to field a full masters team at today’s Shoreline cross country race. Too bad I found that out after yesterday’s short-but-hard bike/run combo, which included a spirited climb up Page Mill Rd, a trail run off the bike in Skyline Ridge, and then a speedy return via Skyline and Hwy 84, dodging Pumpkin Festival traffic on the twisty descent. All of this was followed by an Ironman-watching party at a friend’s, in which several glasses of anti-oxidant-rich fluid (i.e., a nice claret) were consumed. Anyway, sometimes you gotta play hurt. I made my way down to the parking lot sandwiched between Shoreline Amphitheater and some Google buildings for a hilly, multi-loop 4-miler. It’s one of my favorites of the XC Grand Prix series, mostly because it’s not very XC like: packed dirt and gravel fireroads with some pavement thrown in. Forget the XC spikes. I felt none too spry during the warmup, met up with my teammates shortly before the start, and we were off. XC races are notorious for starting hard off the line, and this one was no exception. However, since I have no top end any more, I held back and tried to negative-split the race. That meant I was near the back of the pack in the first 400m, but gradually started reeling geezers in. The first uphill came at about .5 miles, and was the first of three such loops. The good thing was that I thought the race was 5 miles (the old course I ran several years ago was), so I was pleasantly surprised when I realized the suffering would end sooner. Mile 1 was 6:20 – I used to run half marathons faster than that. 🙂 Oh well, kept the rhythm going and started picking off a few more guys, and then pretty much maintained position. Miles 2 and 3 were 6:18 and 6:16, so I was doing a decent job of running negative splits. Down to the final downhill, and the two guys in front of me started their kick, and that’s when I realized how little speedwork I’ve been doing for the past few years of Ironman training – I had no answer. 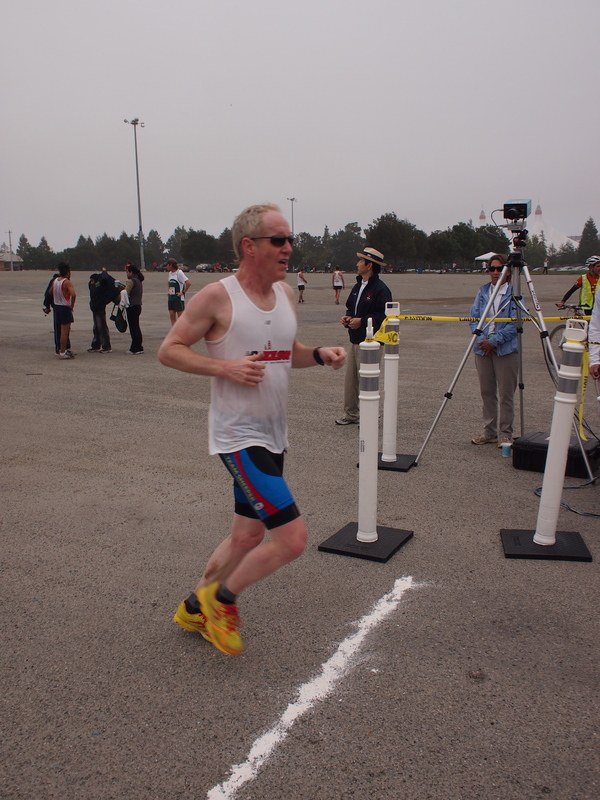 Final mile (or .98, according to my Garmin) was 6:02. So I just slotted under 25 minutes for the 4 miles and was the 5th runner (and scorer) for the team. Went for an easy hour cooldown run with some teammates and headed out for a nice brunch, just as the sun came out and we warmed up into the 70s.